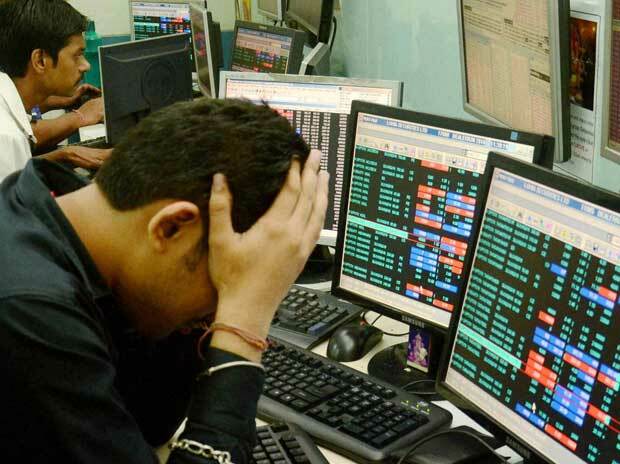 Nearly one out of 10 stocks from the S&P BSE500 index hit 52-week low on BSE in intra-day trade on Tuesday after the benchmark indices opened weak on weak global cues. Tata Motors, LIC Housing Finance, Astra Microwave, Castrol India, Cummins India, Exide Industries, Godfrey Phillips and India Cements are among 46 stocks from the S&P BSE500 index hitting their respective 52-week lows on BSE. At 09:53 AM; the S&P BSE Sensex was down 1,021 points or 2.9% at 33,736, while the S&P BSE500 index slipped 3.2% at 14,318 on BSE. The Sensex plunged 1,274 points or 3.7% in intra-day trade, recorded its sharpest intra-day decline since November 9, 2016, when it fell 6%. Asian shares and US stock futures sank on Tuesday, after Wall Street suffered its biggest decline since 2011 as investors' faith in factors underpinning a bull run in markets began to crumble. US stocks suffered one of their worst days in recent memory in the last trading session, as markets continued to throw a tantrum over rising interest rates. U.K. shares tumbled as a strong U.S. jobs report reinforced the Fed's outlook for three interest-rate hikes this year and investors looked ahead to a new round of talks between the U.K. and European Union starting Tuesday, Angel Broking said in a client note. On domestic front, Indian shares fell for a fifth consecutive session, tracking weak cues from global markets, after a strong U.S. jobs report for January helped fuel expectations that the Federal Reserve will lift borrowing costs more than the three times initially expected this year, it added. Tata Motors on Monday after market hours reported profits of Rs 12.14 billion against Rs 1.11 billion in the corresponding quarter of the previous year. Consolidated revenues grew 16.1% to Rs 741.56 billion during the quarter. The consolidated profits are lower than analysts’ expectations of more than Rs 30 billion. After tuned net buyers of tune Rs 116 billion thus far in the calendar year 2018 till Friday, foreign portfolio investors have sold equity amounting Rs 12.63 billion on Monday, the stock exchange data shows.